Two weeks ago I launched Merrick’s Guide to the Holidays. I’ve been sharing DIY projects, party ideas, gifts guides, holiday style and more, each pertaining to a theme of the week. This week is Husband and Wife week, so I’ll be sharing a few holiday ideas for both men and women throughout the week. But today let’s talk about what to wear to a company holiday party. Every year my husband’s work throws a holiday party, and it’s always a little tricky getting dressed for this event. 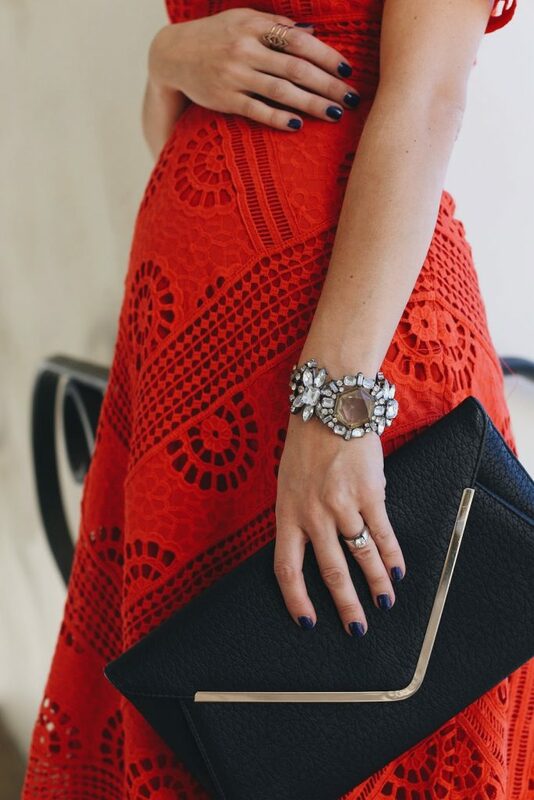 I often opt for a little black dress, since it’s easy and classic, but this year I wanted to go for something a little more eye catching and festive — how about a little red dress?? This one instantly caught my eye with it’s gorgeous detail, and although it’s non-maternity, I was able to squeeze my bump into it (although I’m already looking forward to wearing it sans-bump next year). It keeps selling out and being restocked, but I found a bunch of other gorgeous little red lace dress options that I rounded up in the widget below. They’re all different price points so you can find one that fits your budget. I’m in love with this one that’s a bit pricier, but I’m also loving this one that’s only $34! This one and this one are both simple and chic, and perfect for dressing up with a statement necklace or some big glam earrings. Find all of my favorites in the widget below — click each image for details! Also, don’t forget that The Modern Girl’s Guide to Sewing is on sale this weekend! Today is the last day to snag yourself our online video sewing courses at 30% off. Use code BLACKFRIDAY. Hurry, hurry!